The distinguished British man of letters, Ackerley hardly thought of himself as a dog lover when, well into middle age, he came to adopt Tulip – a beautiful, yet intolerable 18-month-old German shepherd. To his surprise, she turned out to be the love of his life, the ideal friend he had been searching for in vain for so many years. 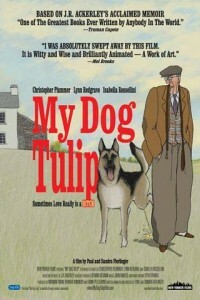 In vivid and sometimes startling detail, the film reveals Tulip’s sassy, often erratic behavior (and very canine tastes) and Ackerley’s fumbling but determined efforts to ensure an existence of perfect happiness for her.